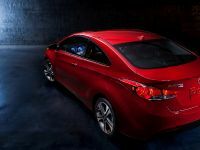 Hyundai has just introduced a new sport coupe variant based on the successful Elantra line-up at the 2012 Chicago Auto Show. 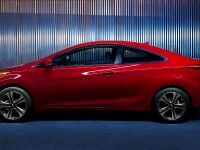 In particular, it is a two-door coupe model of the Elantra sedan and it will be available for purchase this spring. 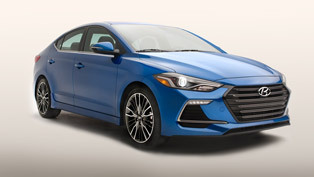 The new 2013 Elantra Sport Coupe has fluidic design theme which is a characteristic of Hyundai, and brings to live the sporty design language. At the same time it has the eco-efficient powertrain, generous convenience features, exceptional roominess and plenty of safety features. 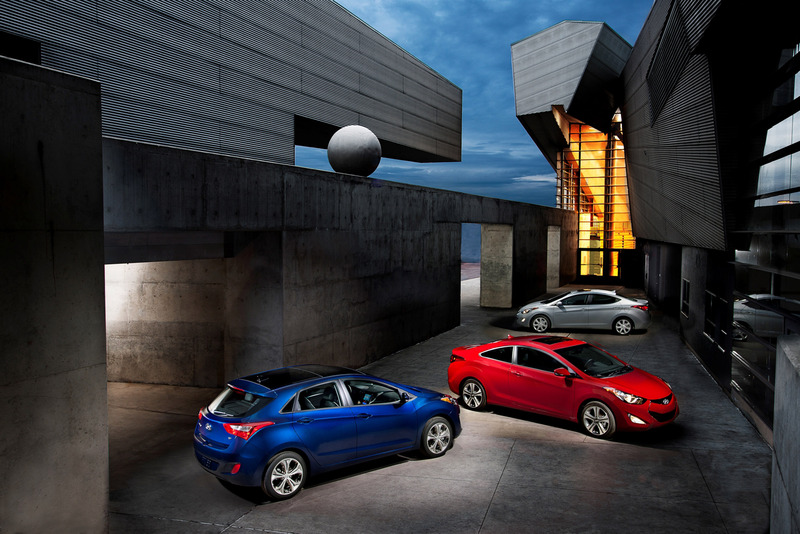 The 2013 Elantra Coupe is Hyundai's modern approach to the sporty coupe segment. The "Fluidic Sculpture" design language replicates the interaction of wind with rigid surfaces to create a perception of fluid in motion. 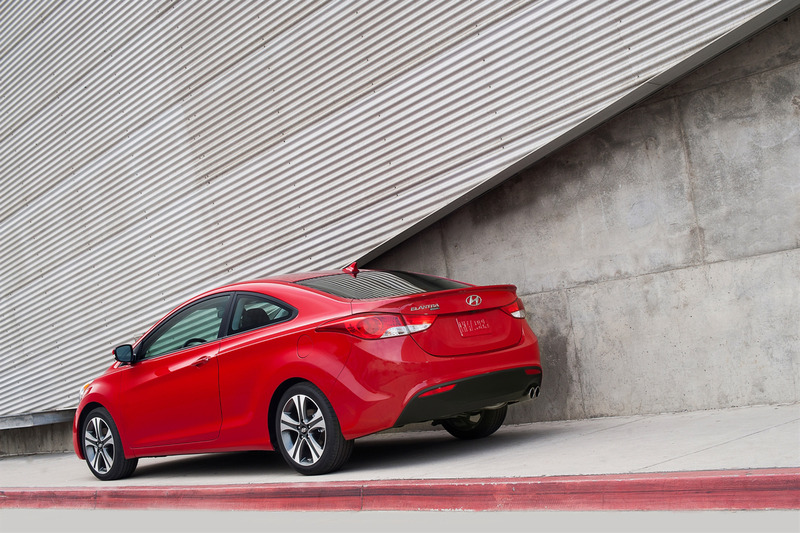 The hexagonal front fascia gives Elantra Coupe even sportier look. 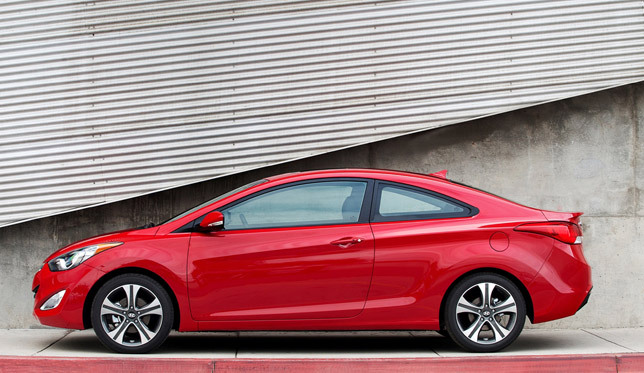 Looked from the side, Elantra Coupe has a sport coupe silhouette with deeply sculpted surfaces. 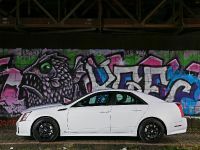 It sits on five-spoke 17-inch alloy wheels with dark spoke insert, which add even more dynamic presence. On the other hand the fast A- and C-pillar angles frame a sharply tapered greenhouse accentuates the wedge profile. Below the belt line, a prominent character line carries from the door through to the rear deck. 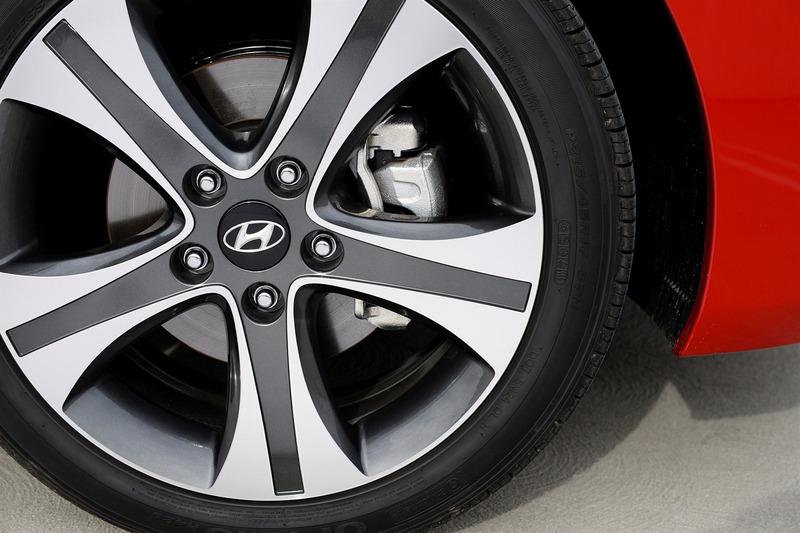 Wheel arch creases give a subtle flared appearance around front and rear wheels. Observed from the behind, a blacked-out rear diffuser valance contrasts with dual chrome-tipped exhaust tips. 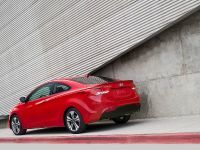 The body is undeniably highly aerodynamic: the drag coefficient for the Elantra Coupe is an exceptionally low 0.28 Cd, which results in minimal cabin noise intrusion and optimal fuel economy. 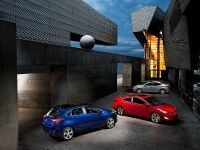 Elantra Coupe is powered by 1.8-liter Nu four-cylinder engine with 148 horsepower (109 kW) and 131 lb-ft of torque (178 Nm). 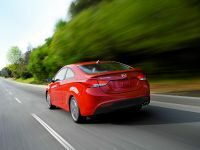 Moreover the Elantra Coupe is as clean as many hybrid electric vehicles, without the extra technological complexity and cost. 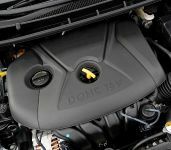 To go further into details, the Nu engine features an aluminum block with a cast-iron cylinder liner, cylinder head and crank. This results in a block that is 30 percent lighter than an iron block, while at the same time still providing equivalent strength. 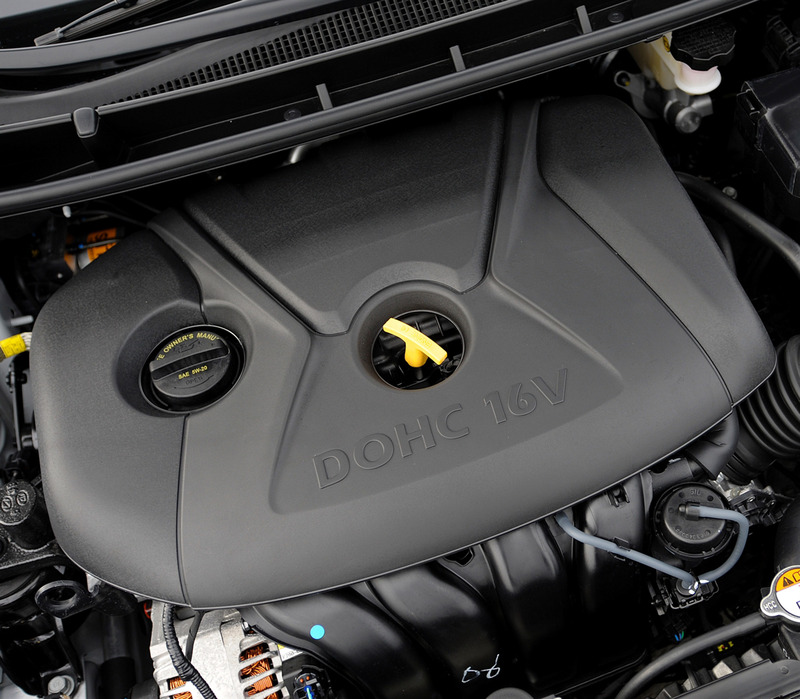 Moreover, the 1.8-liter Nu also offers Dual Continuously Variable Valve Timing (D-CVVT) camshafts and hydraulic engine mounts. This gives the vehicle optimum power, efficiency and refinement. The result is 2 percent improvement in performance, 2 percent improvement in fuel economy and 30 percent reduction in hydrocarbon emissions. In the valvetrain, roller swing arms and hydraulic lash adjusters reduce valve-driven friction to improve fuel economy. The Nu engine also features a maintenance-free silent timing chain to enhance durability and reduce noise, vibration and harshness (NVH). 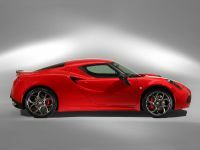 Furthermore there is also included a plastic two-stage Variable Intake System (VIS), which enables intake air to be directed between long and short intake manifolds, resulting in a 4 percent improvement in performance, a 15 percent reduction in cost and 30 percent reduction in weight. The electronic throttle control is the technology which replaces the conventional cable and mechanical linkage with instantaneous computerized control. This advanced system precisely regulates air intake and engine torque, improving drivability, response and fuel economy. 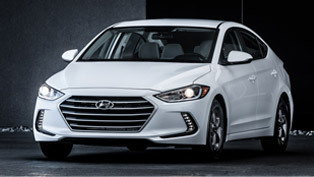 To even further improve fuel economy, Elantra Coupe features double-pipe plumbing technology to the internal heat exchanger, thus improving cabin cooling efficiency, while minimizing compressor size and reducing fuel consumption. The Nu four-cylinder engine also includes an offset crankshaft design that reduces friction and pressure between the piston and cylinder wall. 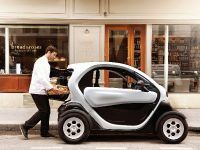 The estimated fuel economy of this vehicle is 29 mpg city, 40 mpg highway for the six-speed manual transmission, and 28 mpg city, 39 mpg highway for the six-speed automatic transmission. 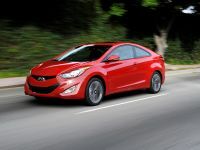 As an option, Elantra Coupe can be equipped with a six-speed manual (M6CF3-1) or automatic (A6GF1) transaxle with SHIFTRONIC® manual control. 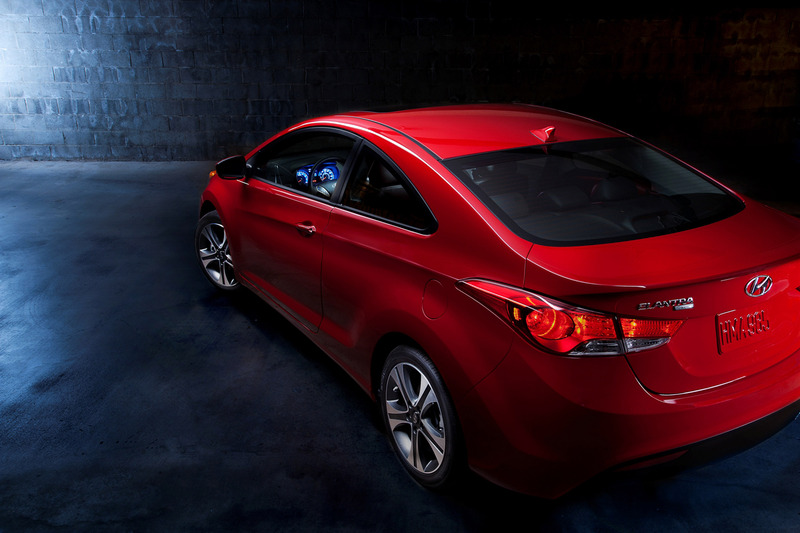 This six-speed automatic is to the 1.8-liter Nu engine and helps Elantra Coupe to deliver improved fuel efficiency. 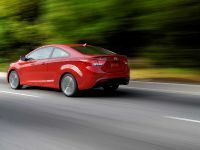 Moreover, the Elantra Coupe's six-speed manual transmission offers positive shift feel and further optimizes powertrain performance. 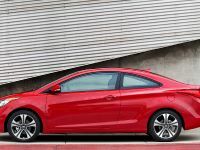 The Elantra Coupe has 106.3-inch wheelbase, an overall length of 178.7 inches, 69.9-inch width, and 56.5 inch height for uncompromised headroom. 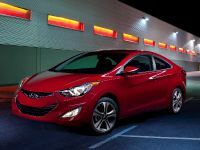 Elantra's total interior volume is 110.2 cubic feet. 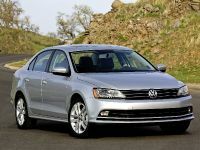 Therefore the Coupe's long wheelbase delivers even more comfort levels. 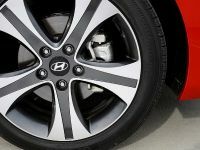 More importantly, the Elantra Coupe is fitted with a McPherson strut front suspension, with coil springs and gas shock absorbers. The rear suspension is a lightweight coupled torsion beam rear design for improved steering stability and monotube shock absorbers. This delivers more driving comfort. 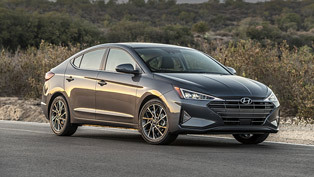 In addition to this, Elantra Coupe offers a sportier SE model suspension calibration that is optimized for its lower-profile P215/45R17 tire. 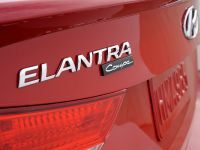 Furthermore on all Elantra Coupes is mounted motor-driven electric power steering (MDPS). Its function is to adjust instantly to changing driving conditions while improving fuel economy over a hydraulic steering system. 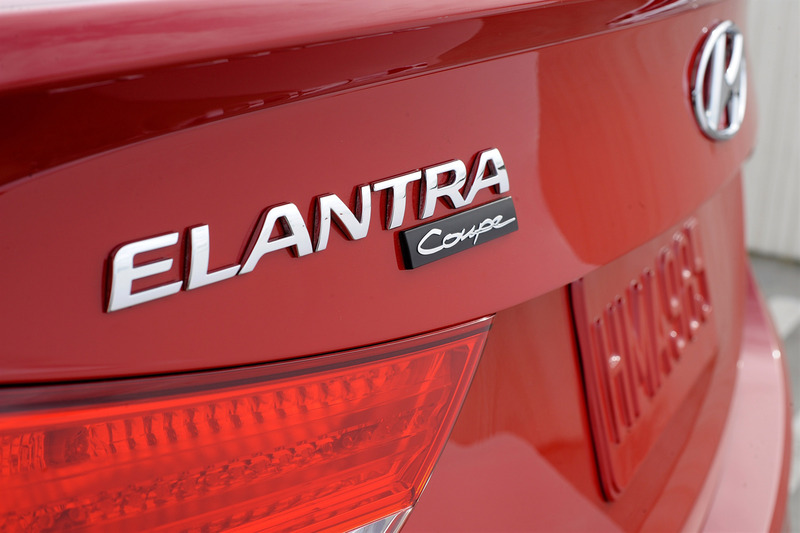 Elantra Coupe offers world-class weight by weighing only 2687 lbs. How about the interior? 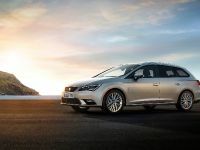 There is of course included a premium interior packaging, lighting, leading-edge design and craftsmanship. For the construction of the seats is used lightweight materials and environmentally-friendly foam. The design of the seats in addition provides deeper side bolsters. 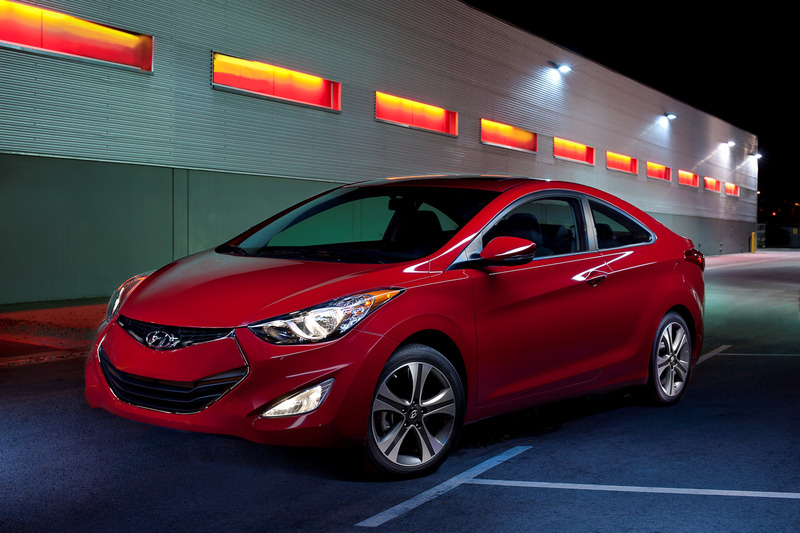 Heated seats are standard equipment on all Elantra Coupes, while the SE model offers sporty aluminum pedals. 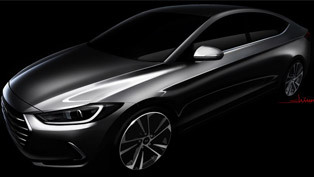 Moreover, Elantra Coupe is being offered with two interior color choices: gray and black. 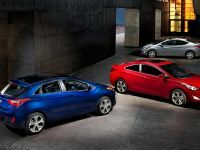 Elantra Coupe also offers seven exterior colors, three of which are unique and newly developed: Monaco White, Black Noir Pearl and Volcanic Red. 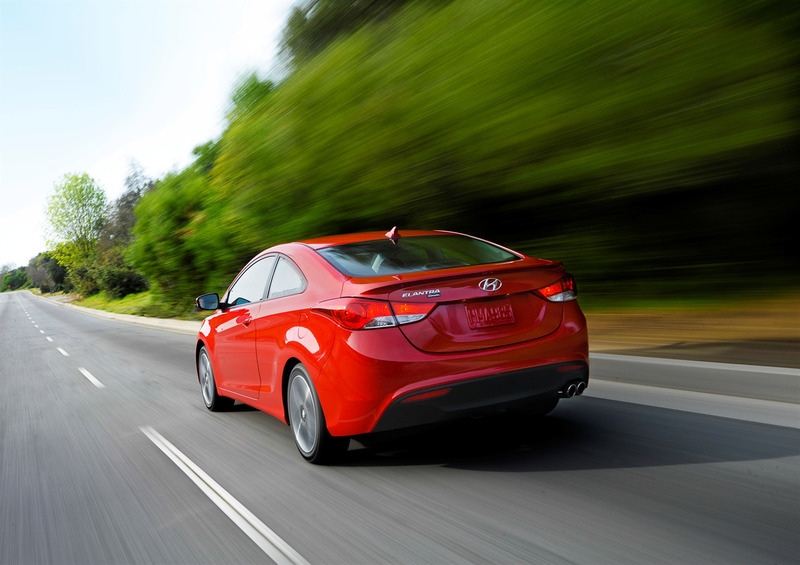 Elantra Coupe is available with two audio systems. As a standard comes the 172-watt AM/FM/Satellite Radio/CD/MP3 audio system with six-speakers and iPod®/USB/auxiliary input jacks. On the other hand the 360-watt system with external amplifier is an optional one. 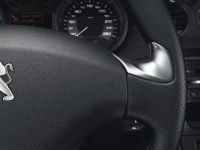 There is also included a touch-screen navigation, which is available on SE trim and includes a high-resolution 7.0-inch screen and voice-activation by headliner-mounted microphone. 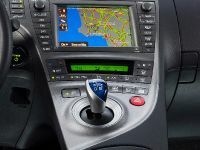 Elantra Coupe owners can also get unique features, such as proximity key with push-button start, leather seating surfaces, heated front seats, power sunroof, and dual automatic temperature control with Clean Air Ionizer and auto-defogger. 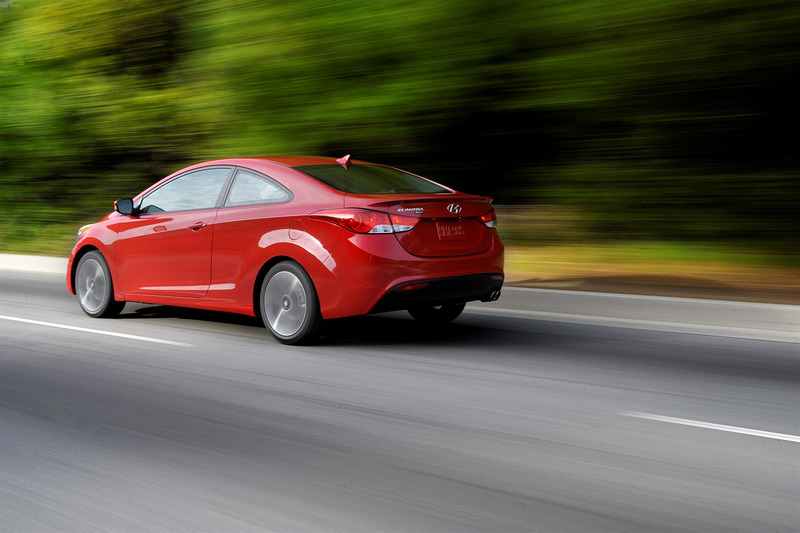 Vehicle Stability Management (VSM) takes the safety features of Elantra Coupe to the next level. 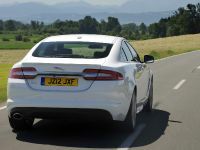 It optimally manages ESC (Electronic Stability Control) and the Motor-Driven electric Power Steering (MDPS). In addition VSM works to control two effects. Firstly, when a driver accelerates or brakes on a split-mu surface (slippery on one side, dry pavement on the other) the VSM detects this condition and sends a signal to the MDPS to apply steering assist. Then the VSM counters the pull and automatically provides eight Newton meters of counter steering force. VSM reacts the same way during sudden lane changes or fast cornering. 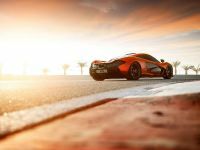 In addition the safety features include as well six airbags and state-of-the-art braking package, which includes four-wheel disc brakes, Anti-Lock Braking System (ABS) with Brake Assist, and Electronic Brake-force Distribution (EBD). At last, in terms of passive safety, the Elantra Coupe has strong body construction, which will effectively absorb and dissipate any impact energy away from cabin occupants.